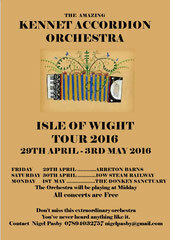 Isle of Wight Tour - May 2016 - Website of kennetaccordionorchestra! Thank you to www.accordioncentral.com for the following review of our tour of the Isle of Wight. Last year saw the Kennet Accordion Orchestra undertake a hugely successful tour of the Isle of Wight. Following the success, last weekend the orchestra visited the Island to do it all over again – however this time with a selection of different venues. This popular orchestra, led by Nigel Pasby and his partner Helen, on the coast of the Isle of Wight on Thursday and were joined by a number of accordion friends for a fun afternoon rehearsal. The concert repertoire for the three concerts included music you wouldn’t necessarily expect to hear from an accordion group. Indeed, the programme included music from Lady GaGa, The Pet Shop Boys, Sting, Queen and The Moody Blues. These were joined with showstoppers from Pirates of the Caribbean, The Last of the Mohicans and The Lord of the dance. Also included were more traditional accordion classics such as Under double eagle. Truly, a varied programme! The first concert on Friday was at Arreton Barns Craft Village and the weather… was lovely for ducks! This meant the concert had to be held inside rather than the planned courtyard event. However the audience of over 50 went away having experienced a fantastic afternoon’s entertainment. Saturday’s event was at the steam railway, in the café area between the two railway lines. The Queen Medley was a particular hit – audience members even got up and danced… although the beer festival that was being run next door may have had an influence. Sunday, as it should be, was a day off for the orchestra. Most of the members took advantage of this and enjoyed themselves exploring the island’s many attractions. The Monday concert was at the Donkey sanctuary on the island. The audience was the best if the weekend and the event was enjoyed by everyone. The orchestra already has a number of invites back for next year and Nigel said “We have had a great time and would love to come back next year and do it all again”.